The Coolest Sports Park Around! 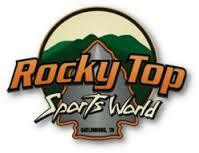 Rocky Top Sports World is Gatlinburg's newest family-oriented destination. 10 Minutes from the entrance of the Great Smoky Mountain National Park and scenic downtown. We are proud to say that we are investing into the quality of our referees for the showcase. We are using the top officials from around the area and we are inviting top officials from around the region to work our event. We are striving to have Tennessee's best showcase experience. $15 parking fee that covers the entire weekend.